When the VTMS is in the real-time chart recording mode, it can alert users or other authorized personnel through e-mail or text message on any refrigerator malfunctions and/or failures, as well as any necessary information regarding the status of the temperature range. By providing users with this information, any necessary actions can be taken immediately in order to ensure that all vaccines and pharmaceuticals being stored are not destroyed as a result of refrigerator malfunctions. 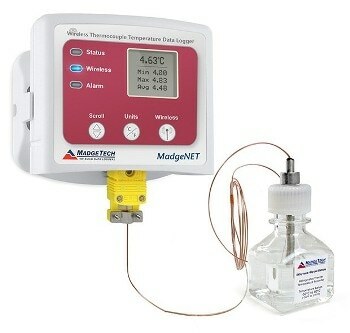 To ensure that no false alarms occur, the RFTCTemp2000A is connected to a Glycol bottle that provides temperature buffered readings. Throughout the world, various countries have approved the use, purchase, and distribution of the VTMS. Provides users with the ability to remotely monitor data remotely on any smartphone, tablet or internet enabled device.